I seem to have my technique down for cooking ribs, chicken, and pork shoulder on my smoker, but that only gives me the entree. A meal, especially one planned for more than a few people, is much more than an entree. Lately, I’ve decided to start working on my sides and appetizers, so that I can do my first big cook right. 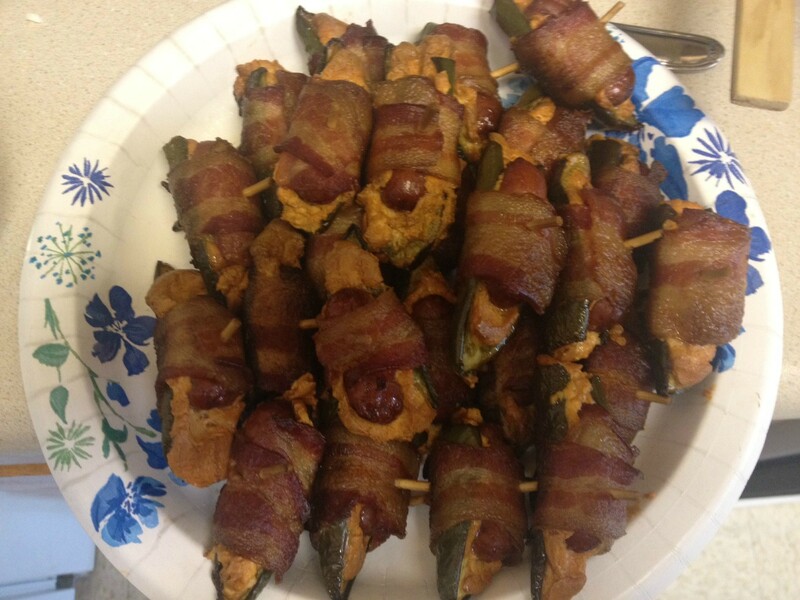 ABTs, or Atomic Buffalo Turds, are the BBQ version of jalapeno poppers. While there are many variations, I got my recipe here. They are very simple to make and take only 90 minutes to cook, so your guests will have something to munch on while they wait for the meat to finish. Of course, standard party fair, such as chips with salsa and guacamole, are completely acceptable here, as well. Your classic BBQ side dishes are cole slaw, mac ‘n’ cheese, beans, and potatoes. Depending on your particular BBQ inclinations or geography, their style may vary, but they’re all accepted. As I am already doing a good bit of cooking, I don’t tend to feel like shredding cabbage myself (it’s also surprisingly expensive here in Hawaii), so I but the bagged mix and make the dressing myself. For full disclosure, Lizz usually makes the dressing, so I’m not 100% that this is the recipe she used, but I know it was a Bobby Flay one. When she made it from scratch, it was great, but we didn’t like the onion. I plan on playing with Meathead’s recipe for “Crack ‘n’ Cheese” and finding the perfect cheese and add-ins. I’ll post again when I do. The wife and I disagree about the perfect baked bean, so we might compromise on a classic Boston recipe, but I’d also really like to try the Bourbon Baked Beans. Results ot my tasty testing to be posted soon. As far as potato dishes go, there are fries and salads for BBQ. Any kind of fries you like (including sweet potato) will work just fine and your salad preference will be just fine, as well. My wife particularly enjoys the Salt Lick’s version (a take on German) and I’m always trying to find a good copy cat. This is my inaugural post in a series aptly titled: Site of the Week, wherein I expose a site that needs more attention than it’s getting or that I’ve only now just discovered. I hope to put out a new one every Thursday, but that is dependent on me finding a worthy site. This week’s site is tunein, a music site that streams radio stations from all over the country to you where ever you have Internet access. As a member of the military, I really enjoy being able to listen to my hometown radio stations and my favorite morning show, even if the time difference makes it difficult. You can even listen on the go, as tunein has an iOS app and an Android app.